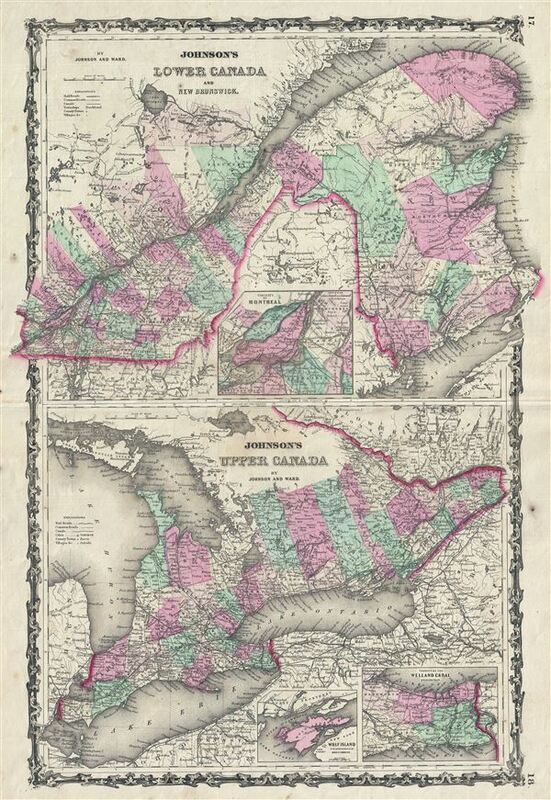 This is A. J. Johnson and Ward's 1863 map of Upper Canada (Ontario) and Lower Canada (Quebec). Features tow maps within a single border. The upper map consists of the provinces of Quebec and New Brunswick. Features an inset map of the Environs of Montreal. Lower map focuses exclusively on Ontario. Features inset maps of Wolf Island and the Welland Canal. Both maps are color coded by district and detail major roadways, cities, rivers, trains and ferry crossings. Features the strapwork style border common to Johnson's atlas work from 1860 to 1863. Published by A. J. Johnson and Ward as plate nos. 27-28 in the scarce 1863 edition of Johnson's Family Atlas. This is the second edition of Johnson's atlas to bear the 'Johnson and Ward' imprint. Very good. Minor wear along original centerfold. Minor spotting at places. Text on verso. Rumsey 2905.007 (1860 edition). Phillips (Atlases) 6140-11a.